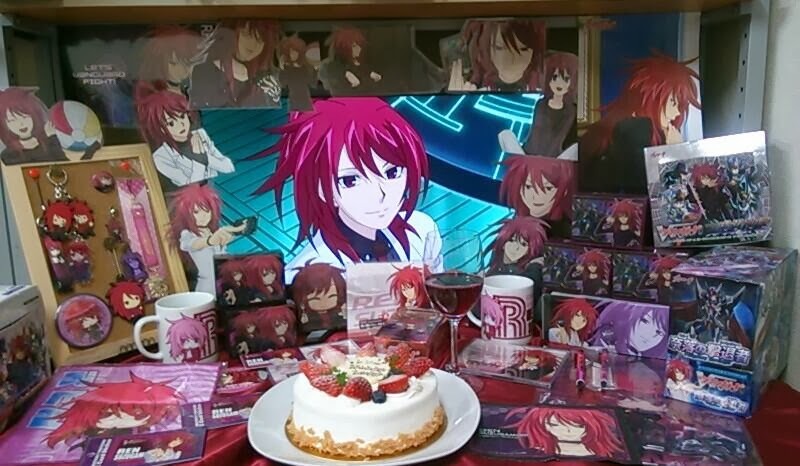 Since December 12th yesterday Twitter and Pixiv have been flooded with Japanese fans observing 雀ヶ森レン様聖誕祭2013 "Master Suzugamori Ren's Holy Birthday 2013" (Suzugamori Ren-sama Seitansai 2013) the advent of Ren's birthday according to his official character biographies. 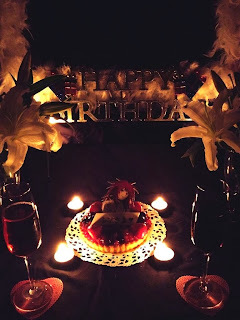 This is the third observation of his birthday since his debut in 2011, and this year has been one of the most visibly observed among Japanese fans, owing to Suzugamori's enduring popularity. The tradition of observing Cardfight!! 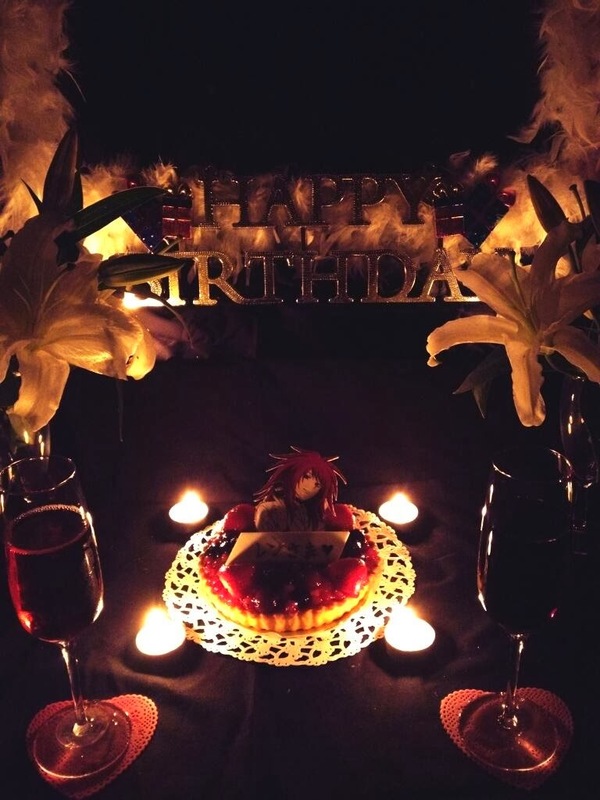 character birthdays began on Pixiv with celebratory artworks, and grew in popularity on social media until it reached a high point in 2013. 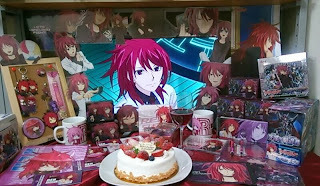 Kai Toshiki's 8/28 birthday is more popular among artists, racking up 12 pages of artworks on Pixiv in 2012, but Suzugamori seems to own Twitter this year with fans going all-out for character shrines, birthday cakes and merchandise. 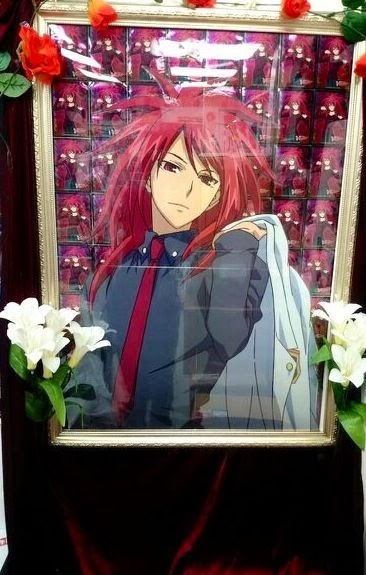 One of Bushiroad's official stores got in on the celebration with a portrait case full of Circuit-era Ren sleeves, framed by the trademark mountain lilies Suzugamori is associated with in the anime. You can browse through yesterday's festivities via the associated tag, #雀ヶ森レン様聖誕祭2013. The kanji used for character birthdays are distinct from a normal birthday 誕生日 Tanjoubi and are also the one of the words used for Christmas 聖誕祭 Seitansai which has a more material slant than the religious term 降誕祭 Koutansai that's also used for saint's birthdays. (The phonetic word クリスマス Kurisumasu is more commonly used, being an approximation of the English word "Christmas." Some English words with similar usage are Christmas for Kurisumasu, X-mas for Seitansai and Christ's Mass for Koutansai.) 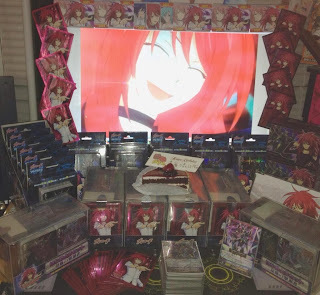 Although rarely seen in the west unless influenced directly by Japanese fans, character birthdays are relatively popular with Japanese fandoms. "Renmas" has proved especially popular this year in part because it coincides with the release of VG-HS06: Beginning Set Purgatory Revenger (はじめようセット 奈落の撃退者 Hajimeyou Setto Naraku no Ribenjaa) the Beginning Set associated with Suzugamori Ren and his new Revenger cards. Sets of these kind are issued annually by Bushiroad, typically reprinting a trial deck with additional promo cards, sleeves and merchandise toward the end of one of Cardfight!! Vanguard's seasons. HS06 is being accompanied by Sendou Aichi's HS05: Beginning Set Liberator of the Sanctuary (はじめようセット 聖域の解放者 Hajimeyou Setto Seiki no Ribereitaa) and for the first time Bushiroad will also be printing additional Beginning Sets later in the month, for Kai Toshiki's TD11 and Mitsusada Kenji's TD12.